Cazino Zeppelin slot appears to be modelled somewhat on Netent's hugely popular Dead or Alive game but presents itself as a little less brutal for your balance along with being a bit more colourful. You have an ornate gilded wooden frame around the transparent reels behind which appears a Zeppelin airship with 'Cazino' printed on it. OK, we get it Yggdrasil, along with the fantasy cartoon characters holding various casino items such as chips and cards: you've made a flying casino! The more important consideration for us though is how quickly this Zeppelin will take off with our bankroll. The grid is a standard 5x3 over which we get 20 pay lines and play to some dramatic classical music to go with our fantasy adventure theme. You get a top pay of 100x bet for the best 5-of-a-kind win being the orange cash man character, the dice man 50x, the card man at 37.5 and the chips boy at 25x for a full line. 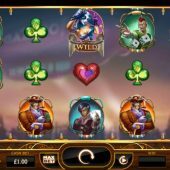 Wilds appear on all reels and pay the top pay also of 100x while the card values offer 8.5 down to 5x bet on a full line. None of the icons are stacked but when you see the bonus potential, that won't be a concern! When you see 3, 4 or 5 Zeppelin bonus chips appear anywhere in view you are treated to a free games round with some high-flying potential. 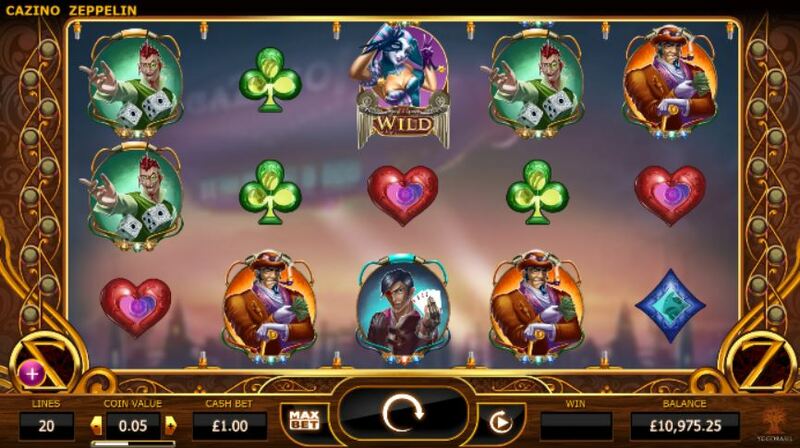 You will be given 10, 15 or 20 free games and unlike Dead or Alive slot you can get a head start with 'Transferring Wilds'. This means that any Wilds in view when you trigger the spins will remain in place on the reels before you start your Sticky Wild free games. If during the spins you manage to land at least one Wild on all 5 reels you will be given an extra 5 spins. That is great as you are likely by then to have some near-complete lines of Wilds, or possibly even one or two full ones so will have the pays repeated or bettered at least five further times.